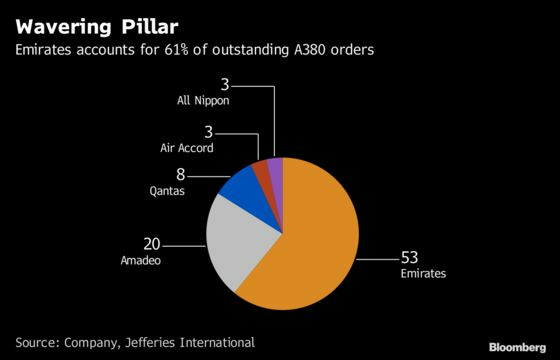 (Bloomberg) -- A year after Airbus SE won what appeared to be a lifesaving order for its A380 double-decker plane, the flagship program’s future is once again on the line. Gulf carrier Emirates may convert some or all of its most recent 20 superjumbo orders into smaller A350s, people familiar with the matter said. The A330neo, another wide-body, is also in the mix, said one of the people. Any switch would slash the order backlog of its largest passenger aircraft -- leading the manufacturer to kill off a plane that’s had limited interest from other airlines, just 11 years after it entered commercial service.